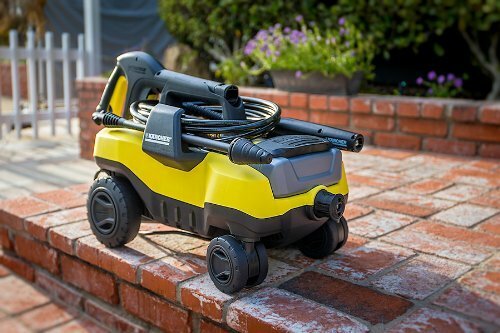 Karcher K 3.000 Follow Me: The Best Pressure Washer for the Home? 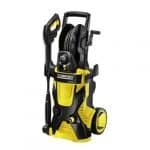 Whenever you think about convenience, power, reliability, innovation, efficiency and performance in your cleaning tasks, then the Karcher K 3.000 Follow Me 1600PSI 1.3GPM Electric Pressure Washer is the machine to pick. 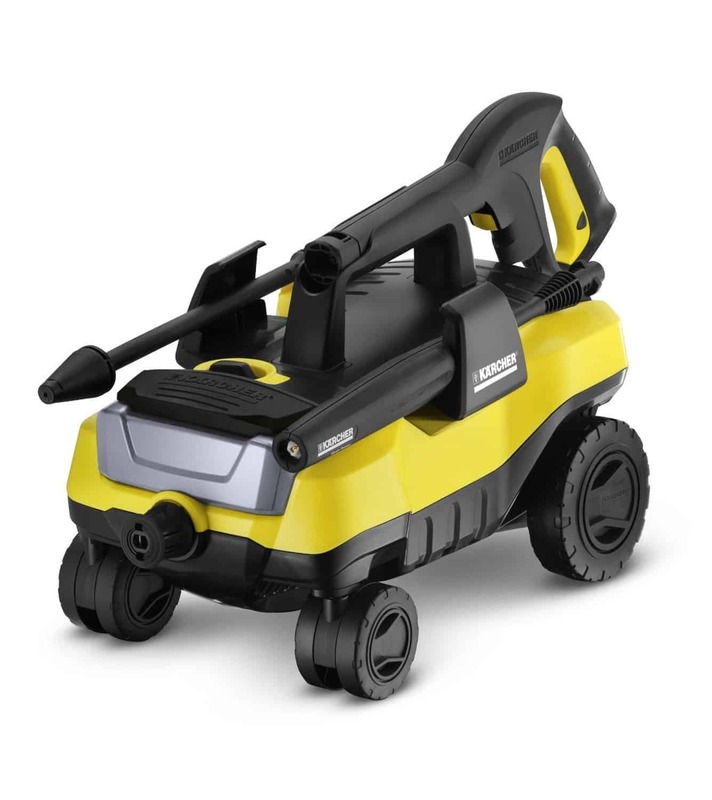 This superb creation from Karcher is actually the true definition of power and convenience put together in a single unit. 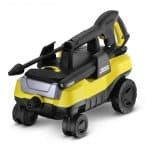 Just like other Karcher electric pressure washers, it carries a great amount of praise given the numerous top-notch features, its ease in use, set-up and the maneuverability it comes with. Its ergonomic design is user-friendly and is made with the aim of making your cleaning tasks much easier. 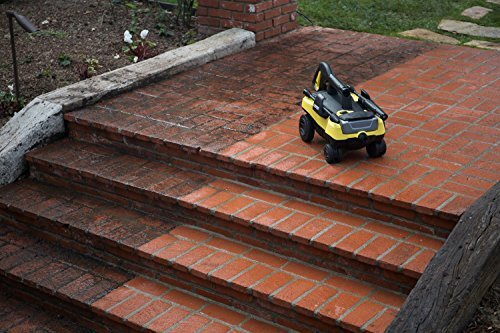 With its ease in connection and maneuverability given the Quick Connect System and its unique 4 wheel base respectively, you have the convenience of it following you around everywhere you need to clean. With its 1600 Psi water pressure in combination with its efficient 1.3 GPM water consumption, you get to achieve a perfect clean with less water and effort as compared to the garden hose and some other power washers. It is definitely the best bet for the dollar. Dimensions: 21.7 by 12.8 by 12 Inches. For a power washer of this caliber, these dimensions are quite small. This compact unit is home to a powerful motor that ensures production of maximum water pressure so as to get rid of all the dirt. This considerably small size also ensures ease in terms of storage and portability. At 16.3 Pounds, this machine is very light. This feather weight property allows easier maneuverability and portability. This, when combined with its 4 sturdy wheels ensures that cleaning is not limited by lack of portability. Its storage is also made easier by this. Being the only pressure washer with 4 wheels, this unique creation provides enough convenience in terms of portability. This Follow Me power washer is designed with oversized rear wheels while its front wheels are mounted casters. 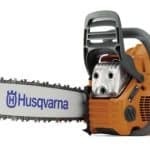 These increase its level of maneuverability as it follows you during your cleaning tasks. Features a maintenance-free N-Cor pump. With a non-corrosive N-Cor pump that requires very little to no maintenance, the K 3.000 can easily draw water from any kind of water source, whether stationary or moving water. This also ensures that enough water is drawn no matter the kind of water source. 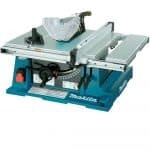 Investing in a machine that is quick and easy to set up and use is usually a wish for most, if not all buyers. No one wants an appliance that will give them a headache connecting and burn them out using. 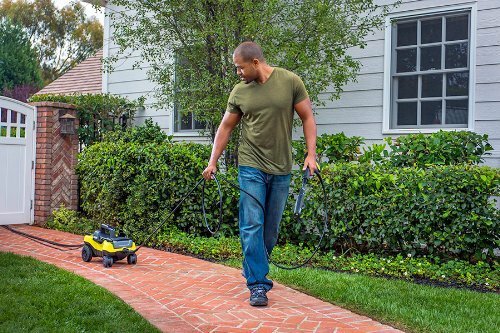 The Karcher K 3.000 Follow Me Electric Pressure Washer tops the list in the easy-to-use machines. Featuring a Quick Connect System that allows the nozzles and wands to connect quickly and easily to the main appliance, set up and use is made much easier. 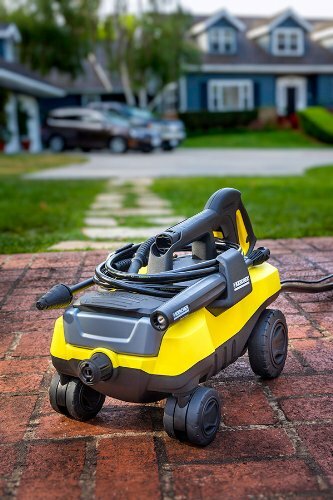 With a water release rate of 1.3 Gallons per Minute, this power washer from Karcher is definitely the best water-conserving appliance available. With its high pressure wands and a very effective and reliable trigger tool that releases water only when in use, a very considerable amount of water is saved. It suffices that investing in this piece of innovative equipment will save you a lot of money in terms of reduced water bills. Water pressure rating: 1600 PSI. Most commercial pressure washers usually have a pressure rating of 2000 PSI. Their pressure washers are larger and quite expensive. Though, the Karcher K 3.000 Follow Me comes with a pressure rating of 1600 PSI, quite high for a residential pressure washer. This water pressure is great enough to clean even the toughest of stains and the roughest of surfaces. 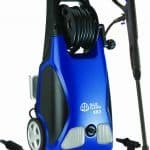 This is an ideal choice for a wider variety of pressure cleaning tasks within your home as it produces 35 times more pressure as compared to the garden hose. Accessories: VPS and GBS wands. The Vario Power Spray wand that can be used to easily adjust the level of water pressure right at the wand is a perfect choice for smaller and lesser cleaning tasks like cleaning of smooth floors. 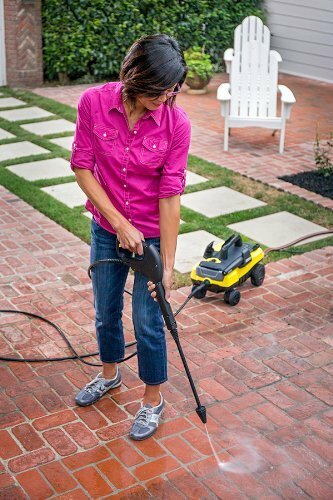 On the other hand, the DirtBlaster Spray wand produces 50% more pressure thus best for tougher cleaning jobs such as cleaning driveways and brick or concrete pavers. The K 3.000 features a Trigger gun with an ergonomically designed handle for easier and comfortable handling as you clean. This trigger gun hosts a Child Safety Lock that ensures safety in case it turns into a toy, especially in households that have children. It also has a molded storage for the trigger gun for secure storage. In addition to these features, it also features an on-board removable detergent tank that allows for the mixing of detergent with the water as you clean. Featuring 4 wheels that ensure ease of movement, this machine is quite the bargain when it comes to portability. 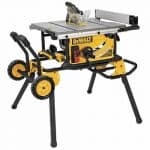 In addition to its oversized rear wheels and front mounted casters, this appliance is featherweight, weighing merely 16.3 Pounds. 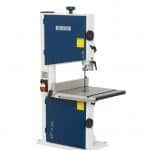 This ensures that moving it and maneuvering it around is a cinch thus your cleaning will not be limited by the weight of the machine. The Karcher K 3.000 is the pressure washer of choice for anyone with water conservation in mind. Since water is a very essential natural resource that should be used with great care, finding such an appliance that saves 80% of water as compared to the garden hose is a great investment for anyone. 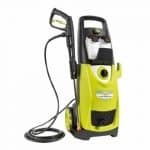 With a water release rate of only 1.3 Gallons per Minute, this electric power washer is the real water conserver in the pressure cleaning niche. 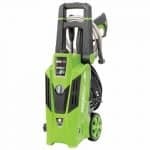 When compared to quite a number of other models, it lies at the top of the list of the most water-efficient pressure washers. This cleaning appliance’s compactness totally disguises its power. Within its compact chassis, there lies a powerful motor that propels the production of water at a high pressure of 1600 PSI. This is powerful enough to clean the toughest dirt and also the roughest surfaces. With its VPS and DBS wands, you get enough pressure to for lighter and tougher cleaning tasks respectively. The DBS (DirtBlaster Spray) wand produces up to 50% more pressure for tougher tasks. 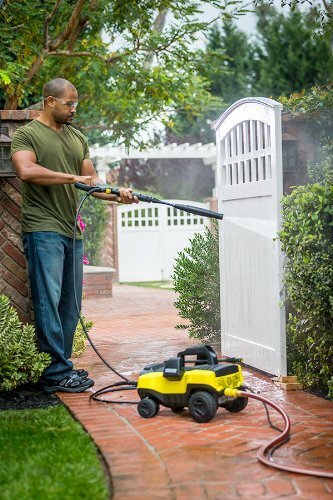 With this wonderfully designed pressure washer, be sure about safety when using it. Its Trigger Gun handle features a Child Safety Lock that ensures that it does not release water when locked. This helps prevent accidents and messes especially when it turns into a toy in households where there are children. It also comes with a secure storage for its wands and trigger gun to prevent destruction, loss or misplacement due to poor storage. 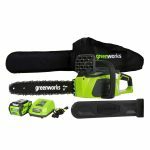 This power washer measures merely 21.7 by 12.8 by 12 Inches and weighs just 16.3 Pounds thus storage of this compact unit is hassle-free. In addition to this, this appliance comes with molded storage for its onboard trigger gun and wands. This ensures that as you plan on its storage, you plan for it as a single unit rather than small separate pieces that could take up even more space. It also features an onboard removable detergent tank that also improves your storage options. 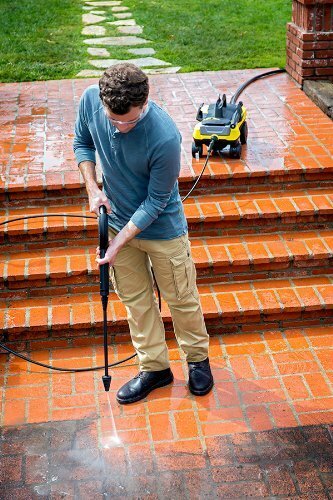 This Karcher pressure washer is designed with comfort, efficiency and power in mind. Right from its compactness to its molded storage for its trigger gun and wands, this appliance will work great while still offering you the comfort and ease of use. The availability of its 4 wheels makes portability and maneuverability extremely ease. To add on this, it is designed to be dragged towards you as you clean. Unlike other power washers that require pushing around, this one follows you behind as you clean thus easier to use. 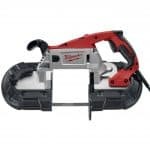 It also features the Quick Connect System that makes its set-up a cinch as it only requires clicking the wands, water inlets and power cord into place and you are good to go. Most users love this appliance for the fact that it has great power yet saves on water. 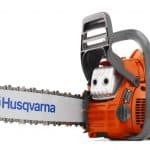 In addition to this, its ergonomic design and ease of maneuverability are also important factors that have gotten most users buying this appliance. 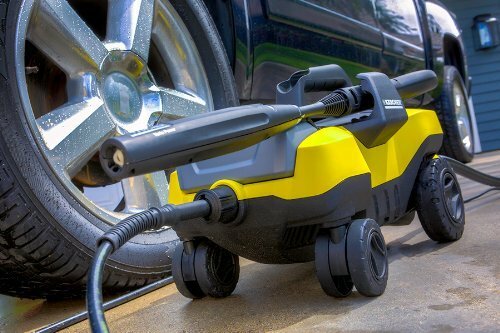 One reviewer by the name Richie C says that this is a great pressure washer. 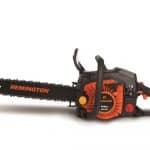 He says that not only is it sturdy but of great quality and that it works great as well. He says that he used it to wash everything from windows to the sidewalks and everything in between. He also adds that it does a great job in washing cars and campers. He recommends this model to anyone searching for a power washer. 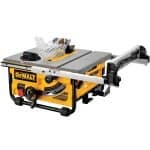 Another reviewer named Adam Cole is really wowed by this machine. He says that it produces tons of power and that there is no longer need for gas. Given the fact that it a corded pressure washer, you will be limited to places with power supply. This machine would have been even more convenient had it been cordless and rechargeable. 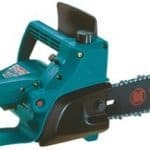 Though, for a corded power washer, there is more reliability as you need not to worry about loss of water pressure as your battery runs low, a scenario that is common for most cordless appliances. Some of the Follow Me’s users have complained of leakages. 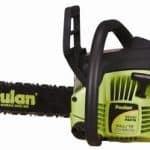 Some of its parts such as its plastic hose connectors leak persistently which may be quite a nuisance for most users. Though, replacing these plastic connectors with separately bought metal connectors will surely stop all these leakages. Karcher is famously known for their manufacture of high quality power washers and this one is not an exception. The K 3.000, by all standards is the best electric pressure washer for a budget. This beautiful equipment from Karcher will actually be a wonderful addition to your cleaning appliances. 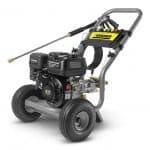 The Karcher K 3.000 Follow Me 1600PSI 1.3GPM Electric Pressure Washer comes with top-notch features that comfortably compete with top-rated high-end power washers and with your budget in hand, this is the best bet for anyone in search of convenience, reliability, efficiency, and power.